lovely post. I wish a had Raju coming by my house. As it is I have to rely on either the local Indian store or Tesco Supermarket. As I walk past both on my way to work or back home, I don't have to buy in bulk. Thats a handy tip to keep in mind once the Farmers Market stops stocking green chillies. I usually buy them and freeze some, which is good only for short time use-as, like you say, they lose flavor. 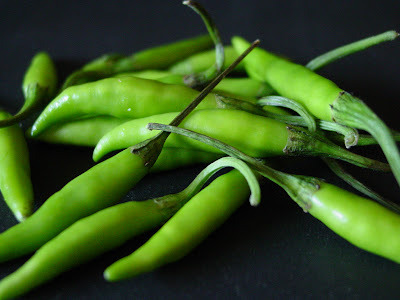 When i don't find Indian chillies, i switch to Serrano peppers, they are similar in flavor! And the sight of fresh green chillies always brings the zing! Hey Manisha!! I do somewhat the same, i just take the crowns off and then store. Now i am gonna just the way you mentioned!! Manisha..same goes for curry leaves too..you can store them upto 3 weeks with freshness by drying, stalking and wrapping them in newspaper(I prefer news paper to paper towels)in a zip-lock refrigerate (I keep them in the door of the fridge to have them more fresh, less moisture). tks for your lovely tips too!! thanks for this tip...i am a queen of excess....and hoard on chillies and ginger like no tommorow!! Hi.. thanks for the tip! Would save a lot of green chilies now :) also .. the other tips are good too! Thanks! Anita, the advantage of the ziploc is that the chillies can be flattened so that they lie almost in a single layer. Since the area of contact with one another is reduced, if one spoils, the chances of it spreading quickly to the others is also reduced. Plus, it saves space in the crisper. I wash and reuse the ziploc. Saju, you are lucky, lucky, lucky! Musy, yup! I buy Serranos and use them liberally, too! Padmaja, the paper towel absorbs any lingering moisture. If you find that it is a tad too damp, change the paper towel. Why do you prefer newspaper to paper towels? I generally avoid newspapers when it comes to food as the print has chemicals that can rub off on to the food. Rajitha, I always have piles of ginger, too! And like with chillies, I refuse to freeze ginger as is or in its grated form. As it is the ginger here has less flavor, freezing it kills it even more. Jai, today? Today?! You really know how to rub it in, don't you?! We have piles and piles of snow (ok, 2 inches and melting fast) which will be followed by a hard freeze that will end the gardening season for this year. Enjoy your green chillies! I am sure they have an unbeatable zing to them! Thanx so much for a million dollar tip. 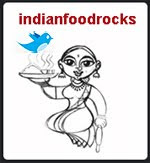 U rock, Manisha. Atlast i found someone who washes and reuses Ziplocs!! Thank you so much for both the tips. My heart breaks everytime I throw chillies. I also do the exact same thing. Couple of months back Alton Brown in his Good Eats, mentioned a wonderful idea of storing carrots in a bubble wrap bag. I have been doing that and it's really a wonderful tip. The carrots stay fresh longer, even upto 3 weeks. or just freeze it..whenever required take it out wash and use it..it stays fresh for months !!!!!! Swati, freezing is definitely an option but I've found that the texture changes and the chillies also lose some of their punch. It's one of the reasons - besides laziness - that I do not make a garlic/ginger-green chilli paste. Good idea about the chillies. I always need to buy and find that they go bad even when I remove the stems. Urgh... paper napkins are coming out next time I buy them!